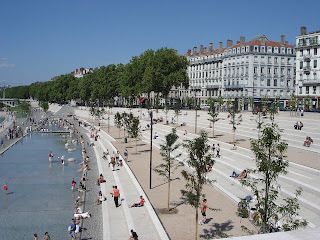 Around the end of July, you can be forgiven for thinking that all Lyon residents have slipped out of town one by one (taking French leave, as it were), leaving the Presqu'ile to the tourists. Folks with money head to their summer homes in the mountains, the middle class packs onto the Riviera beaches. And everything closes. 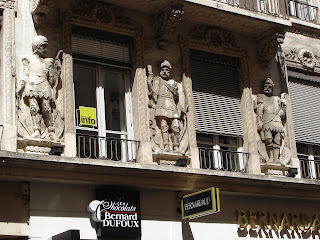 "Fermeture annuelle", it's called, and a great many businesses and restaurants close for the entire month of August. It's particularly noticable on Sundays--when a whole lot of businesses are closed anyway--as groups of Asian tourists wander bewildered up La Republique, taking photos of shuttered boutiques. Having already taken my vacances, I'm stuck in town so my department will have somebody around to answer the phone, and I'm doing my best to carry on as usual despite living in what feels like a ghost town. Sunday morning I had the fairly random idea to take some pictures of doors as I went about my daily business. Ever seen those posters entitled "Doors of Dublin"? 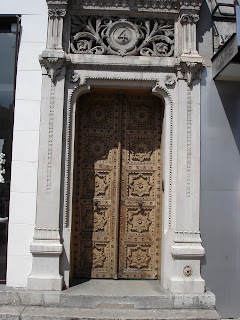 I had occasionally marveled at the impressive, ornate portals on otherwise unremarkable buildings here in the neighborhood, so Sunday I stuck my camera in my pocket and made a mental note to snap photos of interesting doors while on my way to the marche, taking Tater out for a stroll, and so on. Be sure to click on the photos to better see details. In the 1840s a flooding Rhone river badly damaged most of the buildings in what is now our neighborhood. Most of those Renaissance-era buildings were pulled down and all replaced about the same period, 1850-1870 or so. As a result, this neighborhood provides a fairly cohesive architectural snapshot of that time, a big reason for its UNESCO-listed status. One of the features of typical urban dwellings was a tall entranceway [pic]-- large enough and tall enough to admit horses and carriages-- leading into a central courtyard of the building, where the residents would hand over the reins to the footmen (19th-century valet parking). The ground floor of French buildings is still called the rez de chaussee (roughly, "where the footman lives"), and in many buildings remaining for this area the courtyard is still used for off-street parking. This one [pic] is pretty typical, if a little prettier than most. Note the circular window over the double door to let some light in to the entryway while still keeping out the riffraff. Note also the hideous overexposure caused by standing in deep shadow into bright afternoon sunlight. Duh. The entranceway here is two storeys high. This one's right around the corner from us. 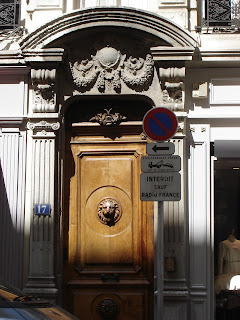 I dig the carved lion, and marvel that it hasn't been defaced, worn away, or graffitied. 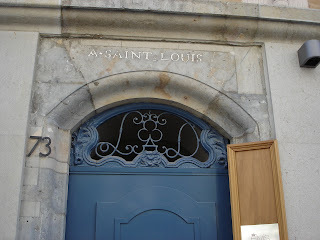 The inscription over the door here implies that this might have been one of the older buildings that survived the flood and was merely renovated at the time. 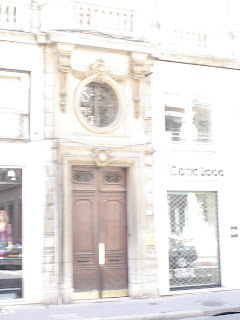 This is actually the building where our regie (real estate leasing office). Is that supposed to be the script letters "L D" in the scrollwork around the ace of clubs? Interestingly, the interior of the building is renovated in a tasteful-but-bland modern style that wouldn't be out of place in a modern American office building such as a bank office. 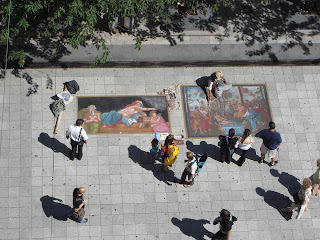 On this one, at 4 Place Celestines, each little nubbin is is painstakingly hand-carved. I wonder if there still exist people who do this sort of thing for a living. Not a door (though it does have four of them): I happened across this totally cherry Austin FX-4 Fairway--better known as a London Black Cab-- parked on the street. 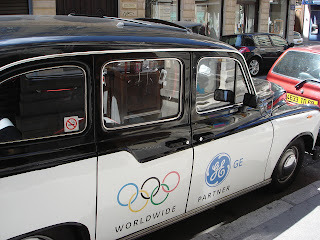 I'm not sure what it was doing here in Lyon, probably something related to promotion for the 2012 London Olympics, but pretty cool regardless. 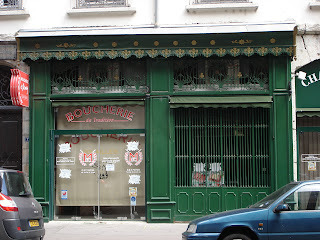 This isn't an interesting door, either, just a butcher's shop in the Ainay, just south of Bellecour. 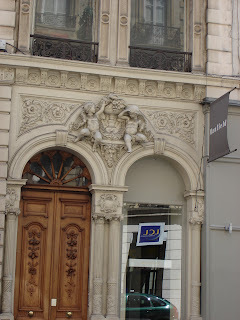 But check out the ironwork over the door and window! Like everybody else, they're closed for their fermeture annuelle. 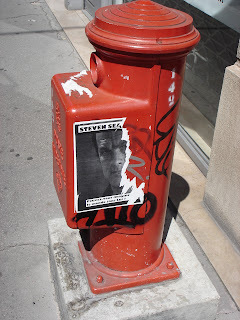 And finally...[pic: fire hydrant, Place Celestines] Translation: "Can you imagine a world without him?" Let me tell you, dear reader, a world without a Stephen Seagal would truly be a world in which I would not want to live.